I haven't had a change in weight this week, which I'm going to count as a positive, since I've had a few set-backs this week. First off, there was Super Bowl. Which meant snacking more than I should on things that weren't the best for me. I was aware of what I was eating the whole time, though, and I know that I did way less damage to those bowls of chips than I would have done normally. I made jalapenos stuffed with cream cheese and wrapped in bacon, so at least there weren't any carbs or sugar in those! They were really good and a hit with the other people at the party, too. Second, on Wednesday, I went to hang out with my friend, H. She's a busy lady between her job as a veterinarian and running marathons, so when she has time to hang out with me on a day off, I jump at the chance! As much fun as it was to hang out with her, I also came across a bit of temptation at the mall we shopped at. There was a little shop selling crepes. I almost never have the opportunity to have a nice, fresh crepe, so I gave in and indulged in one covered in Nutella and sprinkled with banana slices. It was heaven, even though I felt a little guilty. Third, I haven't been feeling well, so I haven't exercised nearly as much. Due to medication changes, I've been nauseous every day. I've also been struggling with headaches for the past week or so. I have had chronic headaches since I was in my teens, but usually they are somewhat manageable. More often than not lately, I can get rid of the headaches with a little caffeine. That's not been the case this week, though, and usually that means that I need a new pillow. Blah, I hate pillow shopping. Anyhow, I have seen enough of a change in myself already that I want to continue making progress, so hopefully I can make some adjustments in my routine. I usually feel fine in the morning, so I guess I just need to be sure that I exercise early in the day. All of this is to say that I had an "off" week. I need to stop the cycle that's happened before when I've made attempts to get into shape, wherein I falter for a day or two or a week and then I beat myself up about it until I give up. I really am hard on myself a lot. I can give me a guilt trip from here to the moon and back. But that's not constructive. One day doesn't define me. Neither does one week. I need to adjust my attitude, adjust my schedule, and move on. 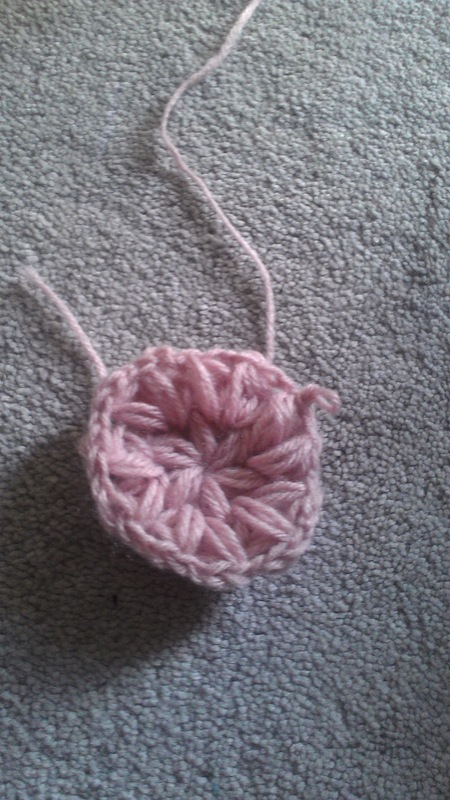 Because my blog address is "leilaniknits", my mom suggested I show what I'm currently working on during my weekly posts. 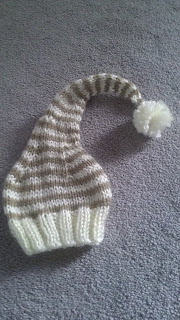 This is a sweet baby hat that I just finished. It will be heading soon to my cousin, A, to use as a photo prop. She's a great photographer and takes a lot of newborn pics. 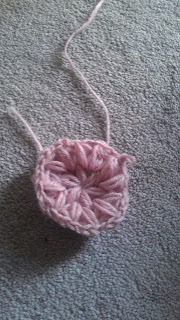 And this doesn't look like much, but it's the beginning of a crocheted baby hat for my across-the-street neighbors who just had a baby girl earlier this week. They are really nice and I'm hoping for some baby cuddle time, so this is sort of a bribe.